Nikolai, with Johnny and Halo. Maybe this work-in-progress piece will be the cover?? Image courtesy of Simon Fraser's twitter page. I'm assuming Dante will be a flashback. I kind of hope so. Is Slaine the beginning of a new arc or a one off? Can't get enough of Simon Davis art. Yeah I really hope so too. But was thinking maybe the 40th anniversary prog will comes in multiple covers. 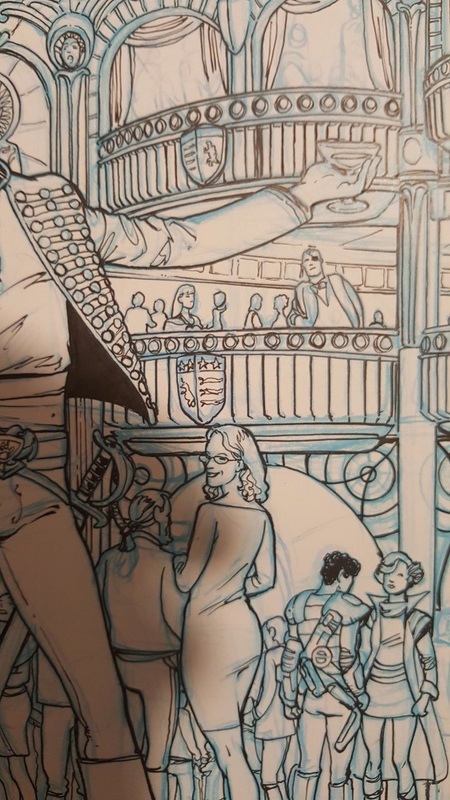 Thinking about it; Most likely the work in progress piece is one of the interior pages, and simply features a fun cameo from Mr Alpha, and Ms Jones. I thought the 40th anniversary prog was a one-off in addition to the regular prog so perhaps it will test the water for a proper return of some characters in due course. Most excited for a Wagner / Doherty Dredd, though. Any idea of the plot? Oh, and Zombo was one of the first graphic novels I purchased after I got back into reading comics, so i'll be looking forward to seeing what Ewing and the brilliant Henry Flint have cooked up. Is it worth it to get caught up on Nikolai Dante? Maybe as good a reason to start getting caught up and purchase the collections? Here's hoping that Peter is fully recovered for the release of the 40th and for the party. Im sure the forum wants to send him all our best wishes for a speedy recovery. Had no idea Peter was unwell. Thoughts and prayers to him for a speedy recovery. Was pleased to be able to meet him at the two last Thought Bubbles, so wishing Peter a swift and complete recovery. His mother has posted on facebook that he is unconcious in intensive care in Sheffield after an operation for a torn aorta. His daughter Hope Doherty is collecting messages from fans on facebook and taking them to her father. I'm just going to echo Rately. Thoughts and prayers with him and his family at this time. Dillon with a ruptured appendix of all things and now this. Aye, saw John Smith's statement on Pete's health the other day. Sent my wishes for good health, having met Mr. Doherty at the last two Thought Bubbles, even owning a wonderful watercolor Dredd head from him, he's an utterly wonderful chap!